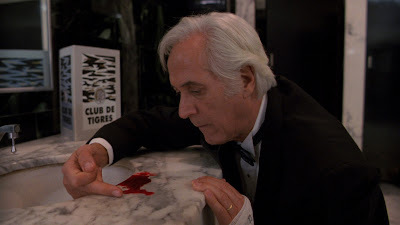 Article first published as Blu-ray Review: Cronos — The Criterion Collection on Blogcritics. Guillermo del Toro crafts fairy tales better than any other filmmaker working today. He has an acute understanding of what makes them tick, and his adept combination of otherworldly menace, childlike imagination and heartbreakingly flawed characters has resulted in films like The Devil’s Backbone and Pan’s Labyrinth. Both films have a heavy dose of horror, but del Toro does more than simply engage in genre exercises, as was apparent even in his debut feature, Cronos. Made in 1993 when del Toro was 28 years old, Cronos is on a similar thematic plane to much of his later work, and in many ways, it feels just as assured as the masterful Pan’s Labyrinth, if told on a more intimate scale. Del Toro takes familiar tropes of the vampire genre and turns them into something far more haunting and touching than works comprised of similar elements. Cronos begins with a prologue that relates the tale of a 16th Century alchemist who creates a device that gives its possessor eternal life — but at a cost. More than 400 years later the device — a golden scarab that's a David Cronenberg-esque combination of organic and mechanical material — shows up in the antique shop of Jesús Gris (Federico Luppi), a lonely man whose constant companion is his silent and ever watchful granddaughter, Aurora (Tamara Shanath). Soon after Jesús discovers the device, it latches onto and pierces his hand, causing the beginning of his transformation from kindly old man into an immortal being with a thirst for human blood. Meanwhile, the thuggish Angel (Ron Perlman) is trying to seize the device from Jesús for his wealthy, dying industrialist uncle, De la Guardia (Claudio Brook). Like most of his other work, del Toro displays a knack for the grotesque, and the fantastic makeup work transforms Jesús into a deteriorating shell of a man, his skin literally peeling off. But the true horror is the fallibility of man, and Jesús’s selfish choices turn him into more of a pathetic figure, lapping blood off a bathroom floor, than an intimidating monster. Much of this is seen through the eyes of Aurora, who del Toro uses in a similar fashion to Pan’s Labyrinth’s Ofelia, and her unwavering love and care for her grandfather is what ultimately allows for redemption — although not without a cost. What makes del Toro’s fairy tales stick in the consciousness is that they aren’t bloodless — literally or figuratively. The choices of his characters have dire consequences — that’s where the true horror comes from. Cronos is presented in 1080p high definition with an aspect ratio of 1.78:1. This director-supervised transfer is a solid one from Criterion, presenting the amber hues of the color palette in a clean and consistent fashion. The transfer looks natural throughout, with a fine layer of film grain allowing for excellent object and facial detail. Reds are especially vibrant, with Aurora’s red sweater and the pool of blood on the white tile floor both coming off as very striking. Damage is completely nonexistent and any digital manipulation is unnoticeable. The 2.0 DTS-HD Master Audio soundtrack presents the mostly Spanish (with English coming from Perlman) dialogue clearly and cleanly, while Javier Álvarez’s score adds some depth to the mix. There are no distracting aural elements to be found. The prologue’s original Spanish voiceover and the English dub created for the American release are both included, with the disc defaulting to the English version. Criterion presents an excellent selection of supplements, combining previously available and new features. Two audio commentaries are included — one with del Toro and one with producers Arthur H. Gorson, Bertha Navarro and Alejandro Springall. Del Toro’s 1987 short film Geometria, which was finished in 2010 with new dubbing, effects and subtitles added, is accompanied by a new interview with del Toro explaining the crude six-minute work. New video interviews with del Toro, Perlman and cinematographer Guillermo Navarro are all excellent inclusions. Del Toro is a fantastically genial and humble figure, and is entirely forthcoming about his own work, while Perlman relates several hilarious anecdotes about his confusion regarding what language the film would be shot in. An older interview with Luppi that Criterion licensed from another company features poor AV quality, but it is a solid interview. The disc also includes one of the most interesting extras I’ve seen this year on any release — a tour of del Toro’s home office, which he’s dubbed Bleak House, and contains thousands of pieces of memorabilia that he’s collected and been inspired by throughout his lifetime. Del Toro’s almost-giddy explanations and the sheer enormity of his collection make this feature a must-watch. Also included is a stills gallery with captions by del Toro, a trailer and a booklet that includes an essay by critic Maitland McDonagh and excerpts from del Toro’s notes for the film. From the beginning, del Toro was a talented writer and director. Cronos is no mere origin curiosity, but a fully formed fairy tale.